A bright and colourful outdoor notice board to welcome visitors, children and parents to your nursery, pre-school or school. 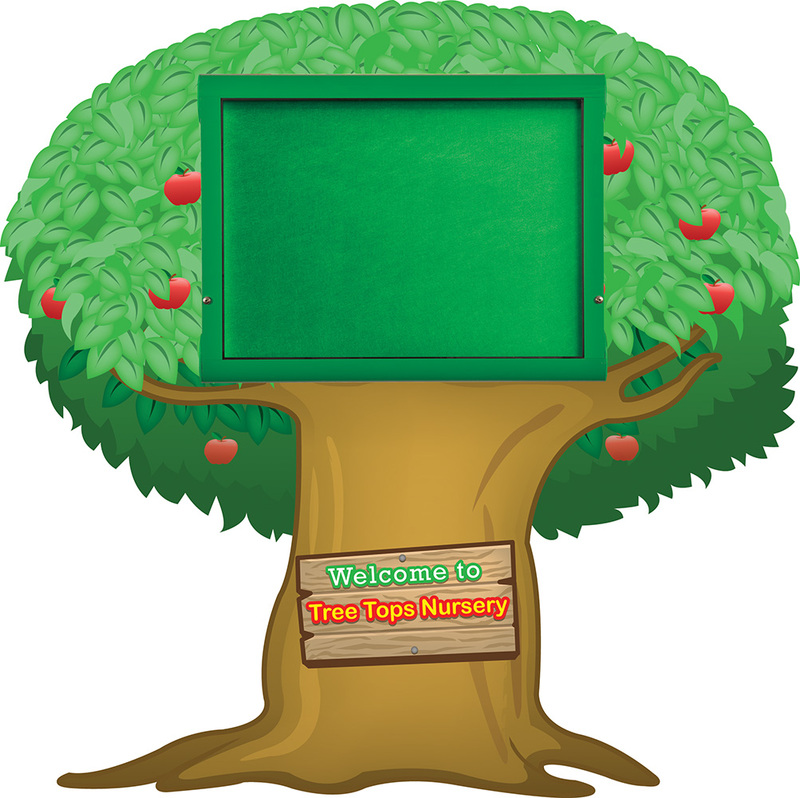 This external notice board has a fun tree design back board which can be personalised for your nursery or pre-school. Print includes ‘Welcome to’ and we will add the wording of your choice. Due to space restrictions, a maximum of 30 characters can be printed. The graphic is printed on a heavy duty, rigid plastic panel which is UV light and weather resistant. In front of the printed tree board is a fully weatherproof notice board, designed for use outside. This weathershield external notice board has an aluminium frame, powder coated in green, with green fire rated, felt pinboard interior. The notice board has a double seal and fully enclosed case which will not let rain or moisture in. It complies with IP55 test of dust and water ingress. The notice board is fixed in a landscape position and has a single door hinged along the top, which is lockable via two locks. It will hold up to 4 sheets of A4 in a landscape orientation. The door has gas strut assisted opening and will open to 90o angle for easy access. The door is glazed with fire rated polycarbonate which is virtually shatterproof. Please note: the noticeboard included has green frame and green felt interior. Images of grey/blue noticeboard are for product illustration purposes only. View our full range of External Notice Boards. Manufactured to order and dispatched within 3-5 weeks.